As Texas Climate News reported in February, President Trump signed an executive order to fulfill a repeated campaign promise to build more wall along the U.S.-Mexico border as quickly as possible. That article focused on the profound effects of existing and proposed wall on internationally significant wildlife resources along the border in Texas’ Rio Grande Valley. Recent events suggest concerns about those impacts aren’t deterring government officials making decisions about new wall construction. Federal officials and contractors months ago surreptitiously began what appears to be preparation work for construction of border wall on the Santa Ana National Wildlife Refuge in South Texas. Word recently got out and has galvanized opposition to that plan – and to the way it has been carried out. On Saturday, Aug. 12, between 700 and 1,000 people marched four miles from the town of Mission to La Lomita Chapel, a historic mission on the banks of the Rio Grande. 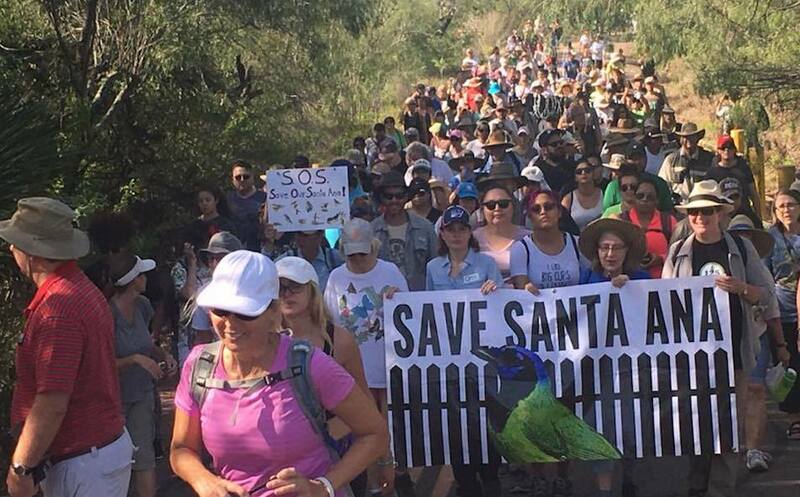 The following morning, about 650 people gathered about 15 miles east on the Santa Ana refuge, at one point creating what organizers called a “human wall of solidarity” – participants holding hands in a line nearly a mile long on a levee across the federal property’s northern edge. Local city officials attended the rally, and Vicente Gonzales, representative for Texas’ 15th Congressional District, spoke, telling the crowd that a wall between Mexico and the United States “puts us on the wrong side of history” and that funds would be better spent improving school systems and preserving wildlife refuges and historic sites. Nicol said going forward, opposition efforts should focus on dissuading the Senate from funding wall construction. The House approved the Trump administration’s $1.6 billion budget request for border wall in July. Several polls bear out that assertion. In February, the Pew Research Center found that 62 percent of Americans oppose a wall on the U.S.-Mexico border. In April, The 2017 Texas Lyceum poll reported that 61 percent of Texas adults oppose the wall, and a survey by the Associated Press-NORC Center for Public Affairs Research found that 58 percent of Americans oppose new spending for border wall. The Center for Biological Diversity, an advocacy group headquartered in Arizona, is fighting the border wall in court, with three lawsuits currently in play. An April lawsuit, joined by U.S. Rep. Raúl Grijalva of Arizona, seeks a thorough environmental analysis of overall border security policy, including the border wall. Another suit challenges prototype walls planned in areas of Southern California that include critical habitat for multiple endangered species, and a third seeks to force the Trump administration to release to the public documents regarding its border plans. The Center also launched a campaign to pass resolutions through states, cities and counties across the country. On August 2, the Rio Grande Valley city of Brownsville passed such a resolution, calling the wall “an offensive and damaging symbol of fear and division” and a threat to the community. Such resolutions, Nicol said, should make it harder for senators in other states to “pretend they think they are doing something good for the border” by funding the wall. Wall opponents are concerned that even if Congress fails to provide funding, construction at Santa Ana could begin as early as November, with Customs and Border Protection (CBP) reallocating existing funds. Land owned by the federal government, regardless of its purpose, represents the path of least resistance – construction on the refuge can move more quickly than if private land has to be acquired. CBP learned that lesson during the first round of border wall construction beginning in 2006. Many private landowners fought condemnation of their land for the wall, with a significant number of those fights yet to be resolved. On the other hand, in the administration’s rush to start putting up wall, private land apparently isn’t safe either. Crews also recently showed up unannounced at the privately owned, 100-acre National Butterfly Center, clearing some of its painstakingly restored native vegetation. Center director Marianna Treviño-Wright told Texas Climate News local CBP agents came to the property the following morning and, when she showed them what the work crews had done, they were shocked. A wall on Santa Ana would cover less than three miles of a ten-mile gap in existing barrier on the refuge, suggesting that a decision to build there would be driven by political expediency, not border security. Opponents fear the wall could ultimately lead to the demise of the refuge, created in 1943 at the junction of two major migration routes to protect migratory birds. Wall construction in general will negatively affect the region’s thriving ecotourism industry, Nicol said, by damaging individual properties providing habitat for wildlife that people come from all over the world to see. A group of wildlife agencies and conservation organizations spent decades and millions of dollars creating these properties, which add up to nearly 100,000 acres. The private Nature Conservancy of Texas owns one of the properties, the Lenox Foundation Southmost Preserve. The organization’s director, Laura Huffman, echoed Nicol’s concern about how the wall could harm ecotourism and, by extension, local communities. “While we share public concerns about border security, as a private landowner, we are concerned about how additional border infrastructure will impact private landowners in Texas, since much of the Texas border runs through private properties,” she said, adding that increased border security does not have to equal further degradation of habitat. In the Rio Grande Valley, though, it very well may. Melissa Gaskill is a Texas Climate News contributing editor. An Austin-based writer, Gaskill’s work has been published by Nature News, Scientific American, Wildflower, Texas Parks & Wildlife Magazine, Smithsonian, Men’s Journal and others. She received a bachelor’s degree in zoology from Texas A&M University and a master’s degree in journalism from the University of Texas at Austin.